This privacy notice provides you with details of how Enigma Pottery collects and processes your personal data through your use of our website www.enigmapottery.co.uk and www.enigmapotteryhomewareandgifts.co.uk including any information you may provide through the site when you purchase a product or service, sign up to our newsletter or take part in a prize draw or competition. By providing Enigma Potteryt with your data, you confirm that you are over 13 years of age. I, Jenny Barton, is the data controller and am responsible for your personal data (referred to as “we” and “Enigma Pottery” in this privacy notice). If you are not happy with any aspect of how Enigma Pottery collects and uses your data, you have the right to complain to the Information Commissioner’s Office (ICO), the UK supervisory authority for data protection issues (www.ico.org.uk). We would be grateful if you would contact Enigma Pottery first if you do have a complaint so that we can try to resolve it for you. It is very important that the information Enigma Pottery holds about you is accurate and up to date. Please let us know if at any time your personal information changes by emailing jbarton@nullenigmapottery.co.uk. Identity Data may include your first name, last name, username, marital status, title. Transaction Data may include details about payments between Enigma Pottery and other details of purchases made by you. Where we are required to collect personal data by law, or under the terms of the contract between Enigma Pottery and you do not provide me with that data when requested, we may not be able to perform the contract (for example, to deliver goods or services to you). If you don’t provide Enigma Pottery with the requested data, we may have to cancel a product or service you have requested but if I do, I will notify you at the time. Where we need to perform the contract between you and Enigma Pottery. Generally, we do not rely on consent as a legal ground for processing your personal data, other than in relation to sending marketing communications to you via email. You have the right to withdraw consent to marketing at any time by emailing me at jbarton@nullenigmapottery.co.uk or by clicking the ‘manage my preferences’ link within the footer of any of my marketing emails. 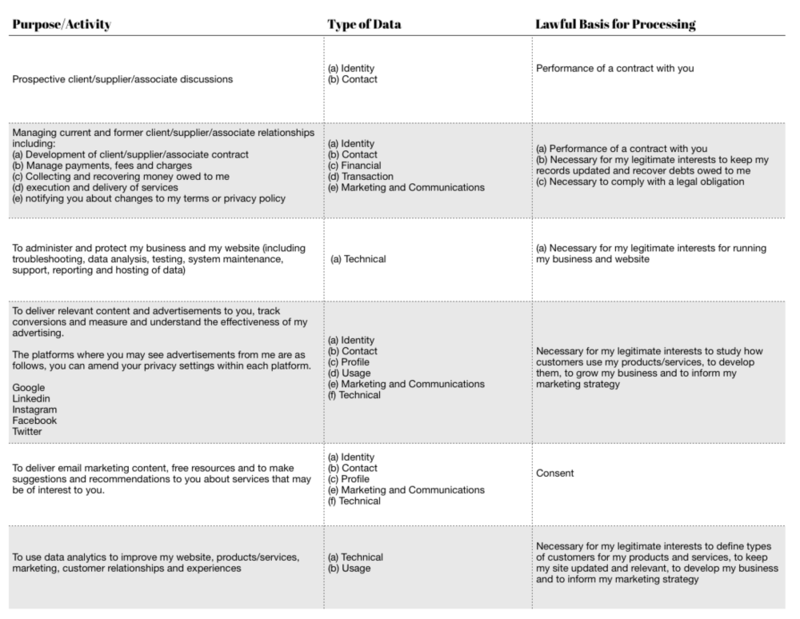 Set out below is a description of the ways Enigma Pottery intends to use your personal data and the legal grounds on which we will process such data. We have also explained what our legitimate interests are where relevant. I may process your personal data for more than one lawful ground, depending on the specific purpose for which I am using your data. Please email me at jbarton@nullenigmapottery.co.uk if you need details about the specific legal ground I am relying on to process your personal data where more than one ground has been set out in the table below. Enigma Pottery does not share your personal data with any third party for marketing purposes. Where you opt out of receiving my marketing communications, this will not apply to personal data provided to us as a result of a product/service purchase, warranty registration, product/service experience or other transactions. Enigma Pottery will only use your personal data for the purposes for which we collected it. Applications and tools that I use to run my business: these change regularly and as such are not listed here. Please email me at jbarton@nullenigmapottery.co.uk if you require details of these. Enigma Pottery has put in place appropriate security measures to prevent your personal data from being accidentally lost, used or accessed in an unauthorised way, altered or disclosed. In addition, we limit access to your personal data to those employees, agents, contractors and other third parties who have a business need to know such data. They will only process your personal data on our instruction and they are subject to a duty of confidentiality. Enigma Pottery has put in place procedures to deal with any suspected personal data breach and will notify you and any applicable regulator of a breach where I am legally required to do so. Enigma Pottery will only retain your personal data for as long as necessary to fulfil the purposes we collected it for, including for the purposes of satisfying any legal, accounting, or reporting requirements. To determine the appropriate retention period for personal data, ie consider the amount, nature, and sensitivity of the personal data, the potential risk of harm from unauthorised use or disclosure of your personal data, the purposes for which we process your personal data and whether we can achieve those purposes through other means, and the applicable legal requirements. By law, Enigma Pottery has to keep basic information about customers (including Contact, Identity, Financial and Transaction Data) for six years after they cease being customers for tax purposes. In some circumstances you can ask Enigma Pottery to delete your data: see below for further information. In some circumstances, Enigma Pottery may anonymise your personal data (so that it can no longer be associated with you) for research or statistical purposes in which case we may use this information indefinitely without further notice to you. You will not have to pay a fee to access your personal data (or to exercise any of the other rights). However, Enigma Pottery may charge a reasonable fee if your request is clearly unfounded, repetitive or excessive. Alternatively, Enigma Pottery may refuse to comply with your request in these circumstances. Enigma Pottery may need to request specific information from you to help us confirm your identity and ensure your right to access your personal data (or to exercise any of your other rights). This is a security measure to ensure that personal data is not disclosed to any person who has no right to receive it. We may also contact you to ask you for further information in relation to your request to speed up any response. Enigma Pottery will try to respond to all legitimate requests within one month. Occasionally it may take longer than a month if your request is particularly complex or you have made a number of requests. In this case, we will notify you and keep you updated. This website may include links to third-party websites, plug-ins and applications. Clicking on those links or enabling those connections may allow third parties to collect or share data about you. Enigma Pottery does not control these third-party websites and we are not responsible for their privacy statements. When you leave either of Enigma Pottery’s websites, we encourage you to read the privacy notice of every website you visit.